My goblets arrived safely. They were so carefully wrapped and double wrapped they made their journey to New York without even a scratch!! Thank you so much for your beautiful designs and thoughtful protective covering. We will "toast" you as soon as we begin drinking wine from our rose goblets! 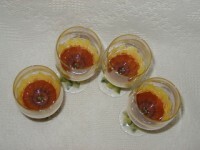 I was very pleased to receive the beautiful special order goblets-- which were truly "very special!" 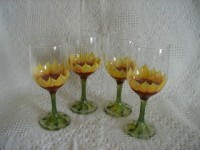 Wine goblets with hand painted sunflowers. For years of enjoyment, hand wash only.